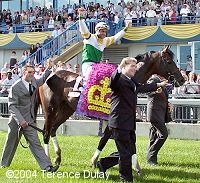 Robert Landry celebrates his first Queen's Plate win on Niigon. 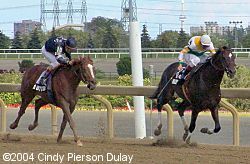 The 145th running of the Queen's Plate, the longest continuously-run stakes race in North America, was contested at Woodbine on a windy Sunday afternoon. 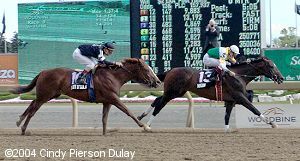 A contentious field of thirteen Canadian-bred 3-year-old colts went to post looking for the winner's share of the $1,000,000 purse and a chance to win the Canadian Triple Crown, a feat attained by Wando last year for the first time since 1992. As expected, Plate Trial winner A Bit O'Gold was sent off as the 7-5 favorite, with trainer Catherine Day Phillips attempting to become the first female trainer to take home the Guineas. 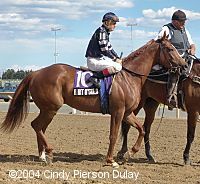 Also in the field was the horse he beat in the Plate Trial, Niigon (pronounced "knee gone") the 6-1 third choice, and Long Pond, owned by the powerful stable of Eugene and Laura Melnyk and ridden by Stewart Elliott, rider of Derby and Preakness winner Smarty Jones who was relatively dismissed as a 12-1 outsider. When the field got underway, jockey Todd Kabel sent Sam-Son Farm representative and 5-2 second choice Silver Ticket straight to the front, and he got the initial quarter in a brisk 23.31 into a stiff headwind with Niigon stalking him to his outside and Long Pond to his inside. Rounding the clubhouse turn, Silver Ticket continued to hold onto the lead through a half in 47.83, then relinquished the lead to Niigon down the backstretch. Favorite A Bit O'Gold continued to rate back in fifth in the early stages under patient handling by Jono Jones. Niigon poked a head in front of Silver Ticket after 6 furlongs in 1:12.94, then Robert Landry asked him for more and he surged ahead by a length and a half at the top of the stretch, after a mile in 1:37.87. Turning for home, Niigon looked home free but looming large was A Bit O'Gold, who made a sharp move on the far turn and was closing well. Niigon was 2 lengths clear with a furlong to go, and easily held off the favorite to win by 3/4 length in a time of 2:04.72 over the fast track. It was another 7 3/4 lengths back to 30-1 outsider Will He Crow in third. Early pacesetter Silver Ticket faded badly through the lane and finished eighth beaten a whopping 19 lengths, while Long Pond saved ground early but faded on the backstretch and finished last, beaten 47 3/4 lengths. Results for the undercard stakes are here. Niigon holds off A Bit O'Gold at the finish of the Queen's Plate. Winning jockey Robert Landry, notching his first Plate victory in his 14th try, said, "It was a great feeling. I had a lot of confidence in this horse for a long, long time. He was a little disappointing over the winter, he pulled it together at the right time. 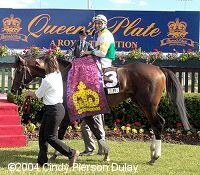 I am so happy to be the person to have won the first Queen's Plate of many, hopefully, for (owners) the Krembils." In deep stretch with Niigon and A Bit O'Gold duelling for the lead. One writer commented that he counted 23 right-handed whips down the stretch, to which Landry replied "No comment! But half of them missed him! He was running comfortable and when A Bit O'Gold came up to him he picked the bit up again and even galloping out he galloped out strong. I think he was going to win regardless if we went around again." 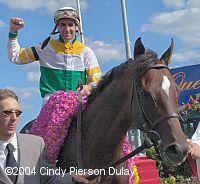 Robert Landry celebrates as Niigon is paraded for the fans after the race. He said, "I've got to give (trainer) Eric (Coatrieux) a ton of credit. He's done a tremendous job with this horse, he's been patient with this horse, he always knew he could run, I always knew he could run, and he deserves this win." Niigon in the Queen's Plate winner's circle. Winning trainer Eric Coatrieux said, "As far as I can see he's an excellent horse. He has lots of acceleration which is good." 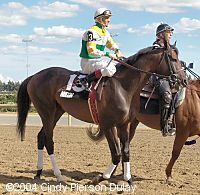 Niigon was easily the best bred horse in the race for 1 1/4, sired by Kentucky Derby winner Unbridled and out of a mare by champion sire Nureyev. 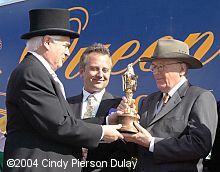 The Honourable James K. Bartleman, Lieutenant Governor of Ontario presents the trophy to winning owner Robert Krembil. Krembil said, "It is a great feeling, it really is. "I was just hoping that he could do it, I thought he would, I though he could do it. Rob gave him a great ride, Eric (trainer Coatrieux) had him ready. He disappointed us a couple of times this spring, I think he is just a late developing horse. Eric had him ready today. (Post 13) wasn't our first choice, but, he had one or thirteen to choose from, that was what was left, and we wanted to be on the outside. Eric and Rob felt it was better to see the field, on the inside unfolding in front of them rather than the one position, so, we were okay with it. It was a long initial stretch before you hit the turn, there's a lot of room. And he has tactical speed, we were comfortable." 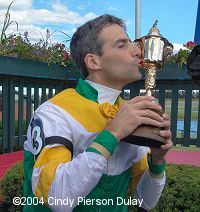 The traditional "kissing the trophy" shot with winning jockey Robert Landry. Landry said, "My whole plan was to try to have a clear trip. I don't know if he's improved, I just think he has always been a talented horse. I think today he has matured a little more, he knows what he's doing now, he is a lot more focused and I think that is a big positive. The horse ran as hard as he's ever ran." Niigon in the post parade. 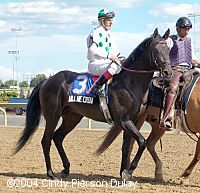 Owner Robert Krembil said, "He's an Unbridled, who are late-developing horses typically and (Niigon) is built like a late developer so I think he's just getting stronger with each day. He is clearly well-bred. He's a great horse in our hearts. We want to make him a stallion at some point." Krembil verified that he will start next in the Prince of Wales Stakes at Fort Erie, the second leg in the Canadian Triple Crown. Second place finisher and beaten favorite A Bit O'Gold in the post parade. His trainer Catherine Day Phillips said, "He tried hard. He gave it good shot." This place finisher Will He Crow in the post parade. His jockey Steven Bahen said, "He ran a huge race. The track is playing as a speed track today. But he came from out of it and ran well. He ran fantastic today. I'm very happy." 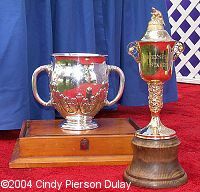 All photos ©2004 Cindy Pierson Dulay.